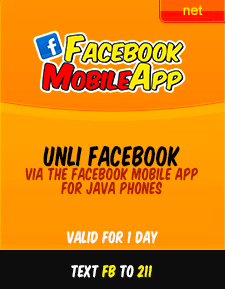 The unli Facebook promo will give 1 day to 1 month unlimited Facebook for mobile, just be sure to install the Java application of Facebook, you can download the app at SMART mobile website. The promo can go as less as P10 per day, and P200 per month. The TNT Facebook mobile unlimited promo can be avail by both SMART/TNT subscribers nationwide. Unlimited Facebook for mobile only. Unlimited Facebook browsing, viewing photos, and all FB activity. Text FB to 211 and click the link of FB App or download using this link http://fbapp.smart.com.ph/ on your mobile browsers. Only works on Java enabled mobile phones. You can download the app via SMART mobile website, grab one now and enjoy Facebook as much as you want.